Last week I shared a tutorial for DIY Jewelry Pendant Necklaces. They turned out beautifully and I am very proud of them. Since these were made as gifts for some blogger friends of mine, I knew I needed to add that extra detail and create a necklace card for them. 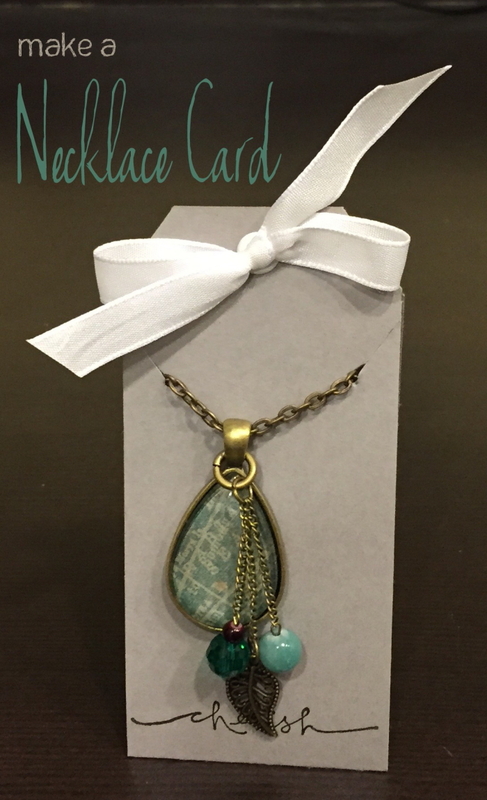 The necklace card is super simple to make and shows that you took that extra step to make the gift look even more presentable. Click through to the next page for the tutorial of how to put it all together! What Can You Make with Pool Noodles? This is a great tutorial that I’ll have to try for necklaces and earrings. Thanks for sharing. Visiting from Create w/Joy. Nice Post!! The necklace is simply glamorous. love this. Simple but gives that extra bit of personalized touch. Thanks for sharing. Ok – now i”m super inspired to make the necklaces and necklace cards. Thank you. Jackie – if you do, I would love to see them! How is the ribbon attached – I’m not seeing it going around the top. Just wondering what is keeping it in the punched hole area. One end of the ribbon goes through the back eyelet hole and then back over the top. Then both ends of the ribbon are threaded through the front eyelet hole and tied in a bow. Does that make sense? Love this tutorial! what type of glue did you use? Thank you, Lisa! I actually didn’t use glue in this tutorial. The two ends of the card are tied together with a ribbon to keep it shut! Thank you Lisa, I am so glad that you were able to put it to good use! Thanks for the directions for the necklace card. It will be very helpful. I make necklaces and the chains get all tangled together, when I take them to my shows. You are welcome Karen. I am so glad that you like my tutorial! I’m confused about the little bag on the back. You found them with Skittles and M&M’s? You are so welcome Michelle, I am glad that you liked the tutorial. You are so welcome Danita, thanks for stopping by. Lovely project. I like how you share the tutorial. Thanks so much for sharing at DI&DI. Thank you so much Linda. Thanks for stopping by! This is so cool! What an easy and great idea to give a necklace! Thanks for sharing at Merry Monday this week! Now, I need to go check out those pendants! Thank you Marie, I am so glad you like them. They do go very well with the pendant necklaces, don’t they. Great idea! Much better than putting a necklace in a box and helping it looks presentable upon opening it. Thank you for linking up with Funtastic Friday! Thank you, Victoria! I agree. I totally believe that the packaging is part of the gift. Can you provide a link where to get the cherish stamp you used? I have been looking for it but couldn’t find it at the Stampin Up website, Thanks! I’m sorry, Zhi. But the stamp set is no longer available. Stampin’ up! products are only available to purchase for 6-12 months and then they retire. Totally cute!! Great idea too! Thank you so much for sharing at my craft party on Thursday! Would love to see your newest posts this week, which starts at 7pm EST. Oooh! Thank you for the step by step tutorial! Perfect! Love it! You are so welcome Gigi. Thanks for stopping by! Hello! What is the number that you used? Great question Chiqui. Any size eyelet will work, I used the 3/16 size. Great question Adelle! I used some double-sided tape to adhere the bag. It works great! I would have never thought of this. 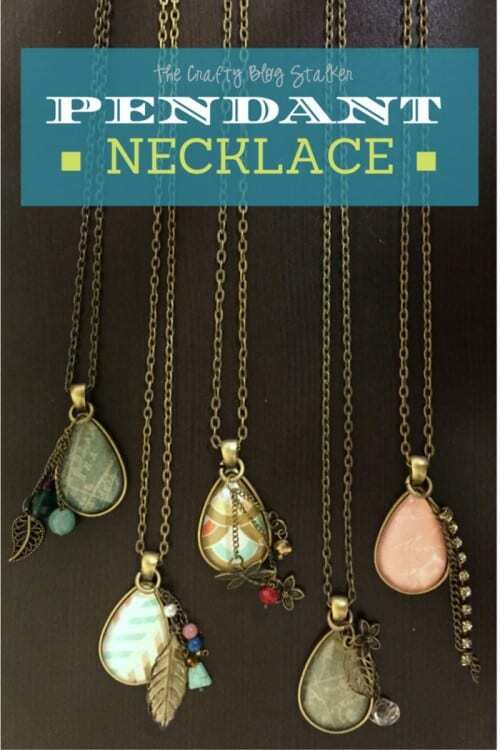 These are really lovely to display necklaces. Thank you Kippi. They are fun to make and a great way to gift handmade jewelry! Thanks for the great post and interesting ideas.